August, 2018 - The BC FORUM office in Vancouver received notice this month that the BC Government under the leadership of Premier John Horgan has proclaimed October 1st 2018 as the International Day of Older Persons. December 1990, the United Nations General Assembly (by resolution 45/106) designated 1 October the International Day of Older Persons (IDOP). Once again, the Council of Senior Citizens Organizations (COSCO) is taking the BC provincial lead on behalf of Seniors’ Voice and the National Pensioners Federation for IDOP 2018. Agnes Jackman, BC FORUM’s Vancouver and District Labour Council Regional Representative, will be COSCO’s IDOP coordinator. The theme this year is “Celebrating Older Human Rights Champions”. Are there people within your senior citizens organizations that are deserving of recognition for the work that they have done for promoting human rights? Seniors’ Voice would like postings of any events/activities celebrating seniors for the IDOP to go on their website seniorsvoice.org. COSCO will soon be sending out a letter to invite all the BC municipal, district and township councils to recognize the IDOP by making a proclamation/declaration (preferably the latter) and/or flying the UN IDOP flag for October 1st. These flags will be available for purchase on the Seniors’ Voice website. Last year’s deadline to ensure delivery before October 1st was August 18th. This year’s deadline is not yet known. COSCO has requested that the BC government make a declaration of the UN IDOP and is awaiting a response. What can you, through your community and organizations, do to commemorate UN IDOP 2018? You can support COSCO’s invitation to your local council to make a proclamation/declaration and/or fly a UN IDOP flag for Oct 1, 2018. You can hold an event to honour the people in your seniors’ (and other) organizations that have made a significant contribution to promote human rights. Remember to celebrate yourself and your contributions to your family and community, and not just on October 1st. 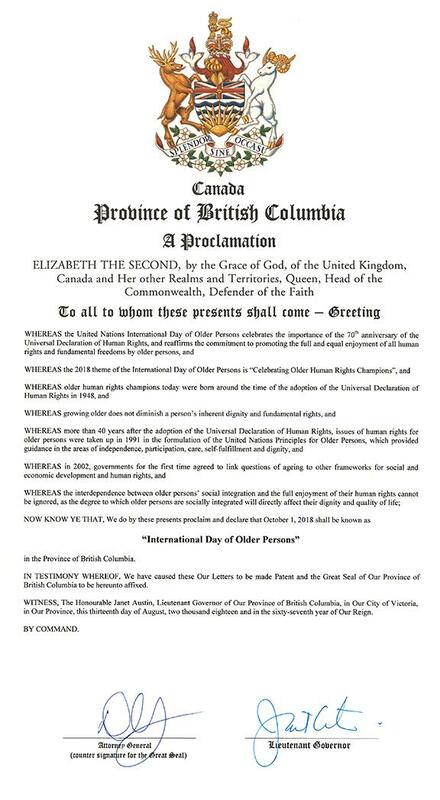 NOW KNOW YE THAT, We do by these presents proclaim and declare that October 1,2018 shall be known as “International Day of Older Persons” in the Province of British Columbia. IN TESTIMONY WHEREOF, We have caused these Our Letters to be made Patent and the Great Seal of Our Province of British Columbia to be hereunto affixed. WITNESS, The Honourable Janet Austin, Lieutenant Governor of Our Province of British Columbia, in Our City of Victoria, in Our Province, this thirteenth day of August, two thousand eighteen and in the sixty-seventh year of Our Reign.